As the city’s appetite for restaurants opening in malls continues to grow, it was only a matter of time that one of Hong Kong’s top luxury retailers, Lane Crawford, would also be furnished with just that: a restaurant within the popular shopping destination itself, one delivering a contemporary interpretation of local Chinese cuisine. SHÈ’s relaxing, nature-inspired space reveals an alfresco terrace set against the backdrop of Victoria Harbour. 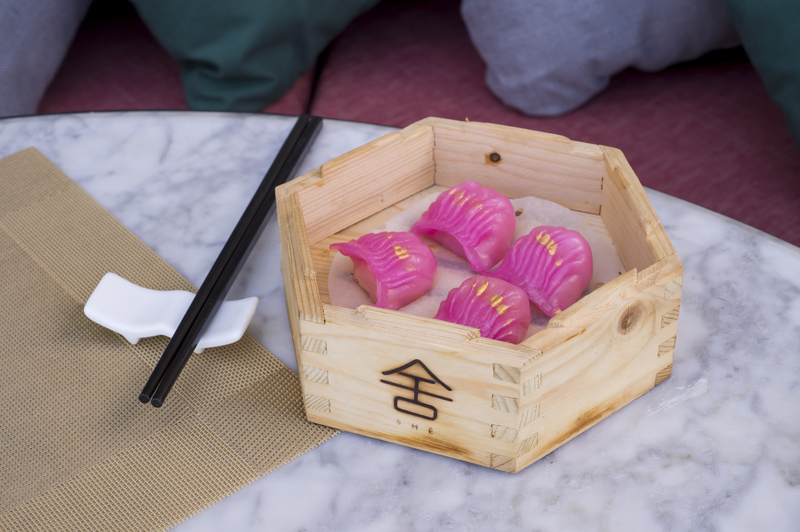 The new restaurant’s name, SHÈ, is derived from the pronunciation of the Chinese word for home or ‘place of rest’, and it’s reflected in the design as well as the food. Diners can expect refined riffs on traditional home-style dishes, served in a stylish interior inspired by nature. Deep marsala-red ceilings are interspersed with leafy walls and forest-green leather chairs, accented with copper details across the bright and relaxed space that comes fully equipped with a chic bar and harbour-facing outdoor terrace, too. But what of these health-forward modern Chinese dishes on the menu? Think Cantonese favourites including dim sum, fresh seafood dishes, rice, noodles and vegetarian bites cooked with less oil, less salt and premium ingredients sourced directly from local producers. Meanwhile, SHÈ’s pledge towards sustainability and against single-use plastics gets our vote, and drinks here are served only with paper straws. Signature wok-fried supreme lobster noodles. Highlights from the à la carte menu include the beloved Hong Kong-style signature of crispy deep-fried shrimp toast topped off with Russian caviar for a bite of decadence, along with a leaner and healthy rendition of stir-fried beef, which is made with M5 Australian Wagyu beef and homemade wasabi oil. Another dish showcasing a popular local delicacy is the double-boiled fish maw nourishing soup, which has been slowly prepared with a premium mix of Chinese herbs in a supreme broth for twelve hours with no added preservatives or artificial seasoning for the perfect belly-warming bowl this winter. For those unsure of what to order, a set dinner menu featuring selected signatures is the answer and is available for a minimum of two guests or more (HK$498 +10% per person). At the top of our list to order is a wok-fried supreme lobster noodle that’s sure to impress the table with meaty pieces of seafood mingled with Chinese egg noodle and a rich XO sauce made in house. Not forgetting dessert, SHÈ looks to the traditional sweet desserts of Hong Kong and serves up stewed bird’s nest cooked with sweet papaya. Dim sum at SHÈ is available for lunch and includes items such as rose gold har gao, Iberico pork siu mai with caviar and more. Available for lunch, the vibrant dim sum menu features handmade creations full of colour, such as the Rose gold har gao, a delicate pink parcel made with champagne to bring out the freshness from the prawns; and the purple lava buns, created with Japanese sweet potato and glutinous rice for a smooth yet chewy, mochi-like texture. Also not to be missed is the pillowy-soft SHÈ bao bao, which can be filled will a choice of roast duck, BBQ pork or melt-in-your-mouth pork belly. The bar serves a unique collection of Asian-inspired tipples to quench your thirst, in addition to “Teatails”, or cocktails created with premium teas and spirits including Cha Cha Matcha, which uses full-bodied and earthy-tasting matcha tea mixed with Courvoisier XO cognac and Mancuno Vermouth. Inspired by the glitz and glamour of old Shanghai, cocktails such as the Geisha Punch make a theatrical entrance with smoke; it has Hendricks gin as its base shaken with elderflower and maraschino liqueur along with organic apple juice. Other premium spirits, bottled, craft and draught beers, as well as a comprehensive and wide-ranging wine list, are also available.